stamping and stitching: Keep Out! Although we have a great time at Halloween and the kids and I love it so much, I’ve never made a Halloween card before. As I don’t have any Halloween stamps I thought I'd try to make a little Halloween scene. Robin has made wonderful Halloween cards using houses, see here and here, so I thought I’d have a go at a spooky Halloween house too. It took me a while to make but I just had so much fun putting all the bits and pieces together. Where to start with a description! The gates\fence are embossed in black and after adding a mask for the moon I applied distress inks (shabby shutters, dusty concord, broken china & faded jeans) for the background. I printed the “KEEP OUT” sign from Word, distressed the edges and applied antique linen distress ink. I used a piece of string (with some antique linen on it) and a sparkly brad to attach the sign to the gate. Now to the inside of the card. I made the background for the house using distress inks (shabby shutters, dusty concord, broken china & faded jeans) and masks for the moon and hill. The path is a scrap (with walnut stain distress ink) left over from another project. I coloured the house with watercolour pencils and added some cracks to the wall with a marker. The occupant of the house has left her broomstick and hat outside – fiddly but fun to make. The tree in the pot has little dots on it so I added an extra dot beside each one to make it look likes eyes peeking out of the greenery. I love decorating our house for Halloween and on the day itself we fill the driveway with leaves so the trick or treaters have to rustle through the leaves up to our “haunted house”. So I had to add some leaves on the ground and on the house like we do at home. Then I just added some googly eyes to finish. I made this card for Hero Arts’ current challenge “Everything Autumn” as well as Jenny’s Wee Memories Challenge #23 - S.O.S.. The S.O.S. 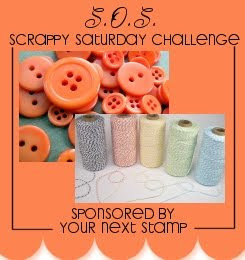 Challenge is to incorporate any 2 of the 3 designs, Scallops, Orange or String into a card\project. So I’ve got the scallops (on the roof), orange (leaves & on house) and string (tied to raffia on broomstick, gold string on witch’s hat & on the keep out sign). The CRAFT CRITIQUE blog is having a HALLOWEEN BLOG CARNIVAL where you can see and share all kinds of Halloween related crafty projects; cards, scrapbook pages, knits, jewellery, clothes, gifts, foods, costumes etc. The Halloween Carnival will run until 14th October so if you have a crafty Halloween project you’d like to share it has to be linked to their blog before that date. Heather this is absolutely stunning, I am blown away with all the detail you have added to this amazing card. Your colouring and distressing are fabulous and I love the googly eyes. A winner if ever I saw one. I love this Heather! Sooo spookily cute! your card is just brilliant, heather! love all the fantastic details! This is SO fun, Heather! Love the googly eyes, and your tiny little broom and witches hat! I bet your boys love this! WOW!! This is fantastic, such work went into this, I LOVE all the details you've shown, so brilliant! Love all the black on the front of the card! Heather, you have done it again! Your card is brilliant and amazing! So many great details but I especially love the googly eyes. Heather, you are amazing! What a fantastic creation! I can see all the love and work that went into making this fabulous card! So many fun details! Just LOVE IT!! This is absolutely funny! Heather, you never fail to surpise me with all your creations! I had to laugh when I saw this card, so cute with all the googly eyes hanging behind the door! Absolutely stunning! Absolutely fabulous card Heather! So many great details and love all the googly eyes! This is just FANTASTIC! LOVE the embossed gate opening into such spookiness! Ack! This is SO super cute! Love, love, love it! Brilliant!! I absolutely love it. Stunning work. What an awesome Halloween card, love this! Oh my! You are sooo very creative! I love this little gate scene! And the sign is just adorable! Love, love, love it!! This is amazing Heather! So many details and so creative and imaginitive! Googly eyes are great looking on to that wonderful scene! FABULOUS!!!! I thought I came by and commented on how ingenious this is!!! Fabulous design and beautiful! It's fantastic - the outside, the inside and the gatefolds !